The legend continues to grow. Roger Federer extended his run of dominance in 2017, clinching his third title of the season 6-3, 6-4 over Rafael Nadal on Sunday at the Miami Open. 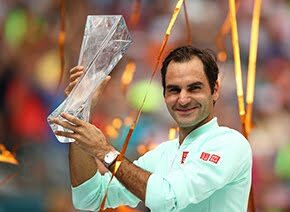 Federer added to his ATP World Tour Masters 1000 legacy, notching his 26th crown and third Sunshine Double (2005-06), having lifted the trophy in Indian Wells two weeks prior. The Swiss, who is projected to return to the Top 5 of the ATP Rankings at No. 4 on Monday, earned his 91st tour-level title in total. On song throughout the fortnight in Miami, Federer rarely put a foot wrong in Sunday’s final, prevailing after one hour and 34 minutes. He fired 29 winners, including 19 off his forehand wing and five aces. The Swiss claimed two of nine break points, while turning aside all four faced. 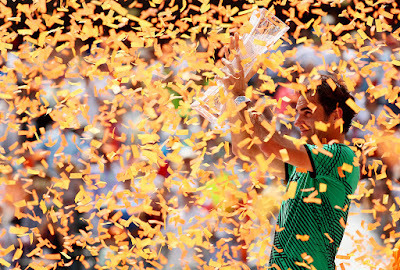 It was Federer’s first title at the hard-court event since defeating coach Ivan Ljubicic in 2006. "I think it was a close match," said Federer. "Maybe if you didn't see the match and you were sitting somewhere around the world and you see the score you're thinking it was straightforward with couple breaks and that was it. "That's not the full story. I thought he had his chances in the first and in the second. It was close. I think on the big points today I was just a little bit better. Why, I have no explanation. I just think it fell that way today. "It was a very intense first set. It could have gone either way really and then the second set started slow from both sides. Eventually I got a few important points and played the right way like I have so many times this year, just very committed, and it paid off at the very end. "It was more of a fight mode I was in today just trying to stay afloat. Physically, emotionally it's been a draining week, so I did very well." Arguably the biggest storyline on the ATP World Tour this year has been the renewal of one of the most storied rivalries in the history of sport. 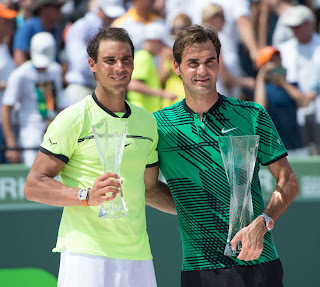 It was front and centre once again at the Crandon Park Tennis Center, with Federer and Nadal writing a 37th captivating chapter. With the Spaniard seeking revenge after falling at both the Australian Open and BNP Paribas Open, it marked the earliest they've played each other three times in a season. Heavy and humid conditions greeted both competitors as they sought to take the initiative early and often. Federer showed his resilience following a three-hour semi-final epic against Nick Kyrgios on Friday. Looking to carry the momentum after a 6-2, 6-3 victory over Nadal in Indian Wells, he would deny break points in three of his first four service games. Federer struck first at 4-3, flattening an inside-out forehand to push Nadal off the court and secure the opening break of the match. He would consolidate a game later to seize the 48-minute opener. Looking to turn the tables in the second set, Nadal would overcome a break point at 3-3 30/40 with a lunging volley winner. Despite employing a more aggressive gameplan, he was unable to change the momentum, as Federer remained calm in the big moments and eventually captured the decisive break for 5-4. The fourth seed emerged victorious on his first championship point as a Nadal forehand sailed long. Flawless against the Top 10 this season, Federer improved to a staggering 7-0 against elite competition and is now 19-1 overall. It is his best start to a season since 2006, when he went 33-1. 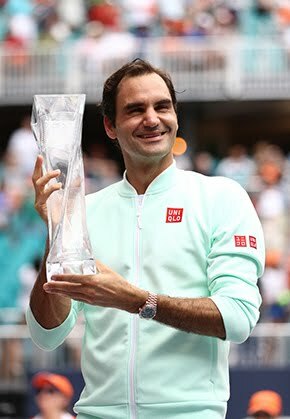 Winning the first 30 and over final in tournament history, at 35 years and seven months, Federer became the oldest Miami champion. "I think that I was close," said Nadal. "I think I was close enough to win the first set. It was not my day. It is true that when somebody is coming with that dynamic like him that he's winning a lot, all the things are going your way. "So that's what happened today, because in the first set I think anything could happen. Then in the second it was close. The same thing: one break and that's it. That's all. It's easy to see that match was a close match. In my opinion, anything could happen and it went his way, so well done for him. "Few things decided the points and the match. For me, it was much closer than what the result says and completely different than Indian Wells." Exactly 12 years removed from their first-ever meeting in a final, won by the Basel native in five sets, he took a 10-9 lead on hard courts in their ATP Head to Head rivalry. Nadal still leads 23-14 overall, but the Spaniard has dropped their four most recent encounters, dating back to 2015. "We've had some epic matches over the years. I truly believe you are going to still win this tournament. You're too good not to," Federer said to Nadal.